Gets moved to the site of the grain elevators that they're demolishing. Which raises a question I've had -- will the relocated sports dome interfere with the planned extension of 27th Ave SE? Here's a bad picture of the 401 University proposal. 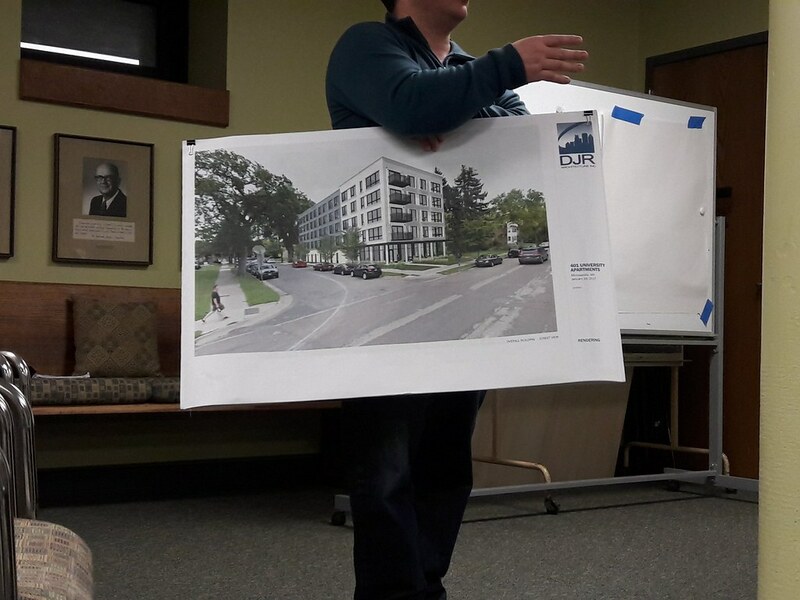 N'hood didn't like the fact that it was 5 stories (especially because it's CPM). They want something around 3-4 like they mention in their master plan. They also don't like seeing car parking line 4th Ave. Want something a little bit more active. There were other weird things mentioned. Like the fact that they're not using any brick, compared to other apartments on University (even though there's almost nothing new). That's a slick box -- I'm surprised the neighbors are complaining! However, if it were trimmed to 4 floors it wouldn't detract from its key qualities. Didn't they just expand/renovate or something? There was construction that disturbed the bike/led path. Yeah. It's not coal is it? I know my sister did very extensive work to divest from coal. The rail spur in dinkytown is not determined by the plant either. It's Minnesota Commercial storage. That looks an awful lot like coal to me. The Old Main Steam plant is the one that they just completed renovations on, and is now a natural gas only co-generation facility (steam and electricity). I'm not clear what the University's plans are for Southeast, but one of the reasons that they recommissioned the Main plant is that they felt that they needed a back-up in case Southeast went down. Since the entire East Bank is heated by the steam plants, a failure during winter could be catastrophic. Although this article suggests that the coal fired burners at Southeast should have been decommissioned once the Old Main plant was reopened. There's also suggestion that there is additional space at Old Main to add more natural gas units (which are much smaller than the coal units they replaced), so it may yet be that Southeast could be re purposed. Some very rough Google Mapping says the current dome + baseball field as laid out could fit where the grain elevators are with room to spare assuming an extension of 27th Ave. I don't personally think one football/soccer field and one baseball field is enough for intramural + random activities for a school of 30,000 undergrads. I'm also not wild that their location is shifted away from the student population center of gravity, but it is what it is. Van Cleve + River Flats + West Bank Fields will have to do to pick up the slack. They still burn coal during the coldest days as Xcel diverts supplies to residential customers during peak demand. I'm scratching my head about your comment, Sean. It makes sense that they'd need more steam to heat buildings on the coldest days, but I don't think that Xcel should have anything to do with it -- it's closed system that only feeds the University, no? Is Xcel not feeding them enough natural gas on the coldest days? When demand exceeds supply for natural gas, utilities are required by law to prioritize residential customers over commerical and industrial customers. Though, to be nitpicky, Centerpoint is the natural gas utility in Minneapolis. So, regarding the coal storage building -- my understanding is that it was never feeding Old Main, which was de-commissioned and idle for the preceding fifteen years or so until the new boilers were installed over the last couple of years. I understand that it was a transfer point from the trains into a conveyor belt that feeds the coal bin that's adjacent to Southeast. I think this is actually a better location, since it is closer to the light rail stop. The steel silos appear to be gone now. "[T]he climbing facility would have a dramatic, sloped roof inspired in part by the Sawtooth Mountains near Lake Superior and would be clad in mostly metal panels. The second portion of the building that would make up the main entrance will resemble a small box." Haha, glad they clarified the shape of the second portion. Nearly $1B bonding bill includes (finally) $66.7M for the Health Sciences Education Center. Nearby, the Pioneer Hall renovation has started.